At long last I have my craft room back in order so that I can get creative in comfort again. All I need now is a new CD player so that I can listen to my favourite music at the same time. I knew my mojo was in desperate need of nurturing so we had a taster session this weekend and I thoroughly enjoyed my playtime and even the long awaited rain couldn't dampen my spirits. 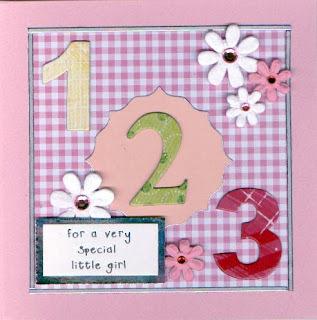 Digging through my stash of paper crafty things I pulled out some pretty pastel blank cards measuring just 5x5". I matched them up with pretty gingham backing papers and a mix of paper flowers I got from Joanna Sheen some time ago. 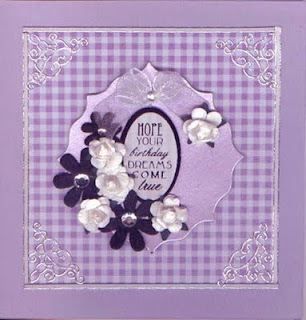 Digging deeper in my stash I found an assortment of embellishments and peel offs and I was ready to create! Just basic layering and a few adornments were all it took to make my first card and I was so pleased with it I just couldn't stop there. If a basic design is quick, attractive and successful, why stop at one! At least that is how I think and so I got to grips with my next card. Wow! I was on a roll. I chose green for my next colour although it isn't a colour I would normally go for so it was a challenge and what a challenge it turned out to be! 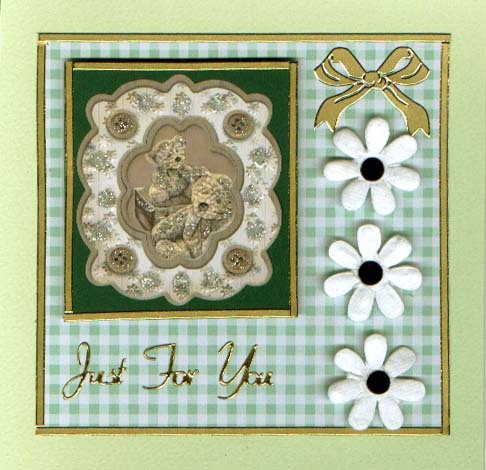 I just don't 'think' green and I struggled to make my next two cards. 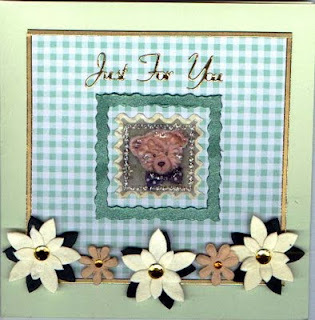 I don't do cute either so it was a real surprise for me to find myself working with cute bears but they saved the day and came together nicely with the green background. The green was looking good but my inspiration was flagging and I should have called it a night there and then but what did I do? Went on to pink! This one just about had me beat! So I made it simple with less embellishments and I think I managed to pull it off with the butterfly. Just a simple peel off stuck on the same gingham background paper and stuck down so that the wings lifted. 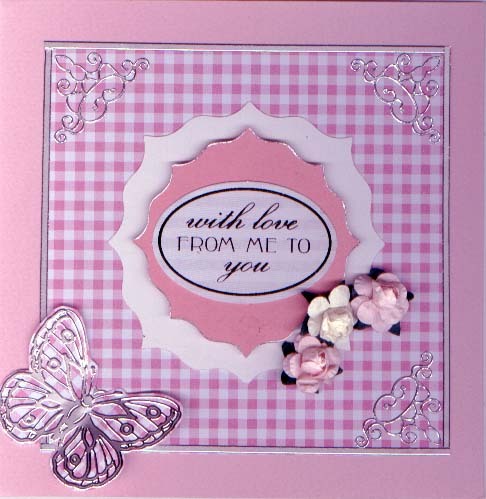 Thats when I called it a day but bright and early the next day my mojo was buzzing and I set to creating another card in pink. with hardly any forward planning. As easy as one, two, three! The images shown here are scanned and may have looked better as photographs. Hmmm, maybe its time to get a new digi camera. Thanks for reading my blog. Please feel free to comment. 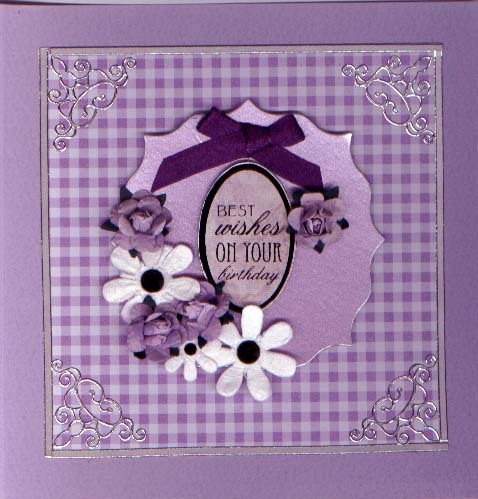 Hi Carolyn, Your cards are fab, it looks like you're on a roll!.. Thanks for sharing.